Erdogan said during a television interview on Sunday that the Hagia Sophia might be “reverted” into a mosque, referring to the structure’s status as a mosque following the Ottoman conquest of Constantinople in 1453 A.D. The Hagia Sophia was constructed as a relatively modest Greek Orthodox church in 360, was destroyed and rebuilt several times, and became the architectural marvel we know today in 537. When the modern secular Republic of Turkey was founded by Kemal Ataturk, the Hagia Sophia was converted from a mosque to a museum, a status it has held for almost 75 years. “We may as well take a step and change that,” he mused. Erdogan floated the mosque conversion in response to a question about whether admission fees to the Hagia Sophia museum might be waived by his government. The Blue Mosque, formally known as the Sultan Ahmed Mosque, is located directly opposite the Hagia Sophia. It was constructed in 1616 as an Islamic response to the majesty of the Hagia Sophia and is regarded as one of the greatest architectural achievements of the Ottoman Empire and among the most elaborate Islamic houses of worship in the world. Its popular name comes from the tens of thousands of handmade blue ceramic tiles covering its floor. Erdogan’s remarks alluded to the fact that the Blue Mosque is both a museum and an active house of worship, permitting tourists when prayer services are not in session. It is also possible Erdogan floated the mosque proposal as a populist gambit to goose turnout for his AKP party in the municipal elections that will be held next week. The Turkish president has been criticized for irresponsibly using video of the New Zealand shootings to whip up populist, nationalist, and Islamist fervor ahead of the election. The Greek government strongly objected to these proposals on Monday. Foreign Minister George Katrougalos pointed out that Erdogan explicitly ruled out converting the Hagia Sophia into a mosque in a speech he delivered less than two weeks ago. “It is not only a great temple of Christendom – the largest for many centuries – it also belongs to humanity. 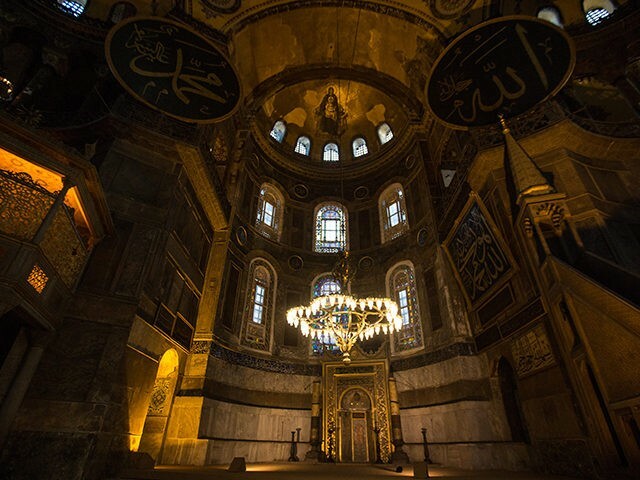 It has been recognized by UNESCO as part of our global cultural heritage,” Katrougalos said of the Hagia Sophia. “Questioning of this status is not just an insult to the sentiments of Christians, it is an insult to the international community and international law,” he insisted. Relations between Turkey and Greece have been strained for years due to such issues as ownership of islands in the Aegean Sea. Those relations became considerably more strained on Monday when two Turkish fighter jets violated Greek airspace and harassed a helicopter carrying Greek Prime Minister Alexis Tsipras to the Aegean island of Agathonisi. “I was harassed by Turkish planes that forced the helicopter I was on to take evasive action, and for what purpose?” Tsipras asked after the incident, which prompted the Greek Foreign Ministry to file a formal complaint with Turkey.